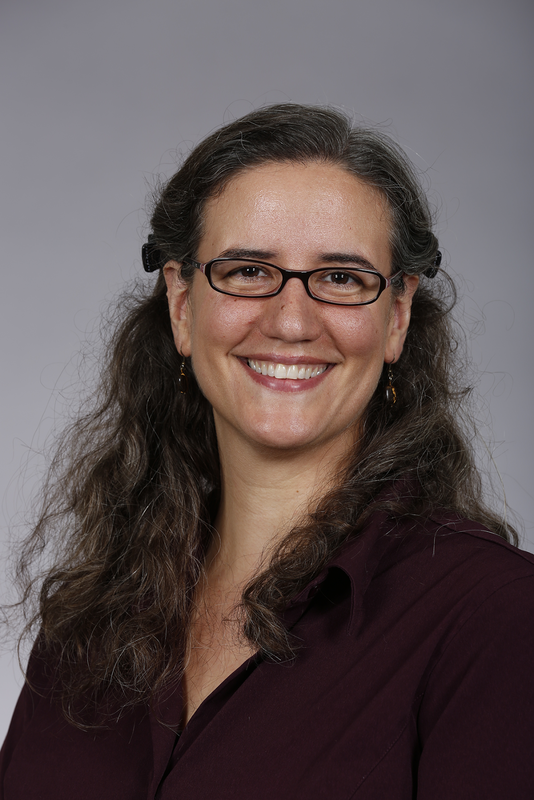 Today, for Author Interview³, I welcome Karen Bovenmyer to the blog to share her work. • I’m dyslexic, so I had a rough time getting my ideas on paper until high school. To this day, I read and write much more slowly than many of my author friends, but it’s always an intense experience I feel deeply. • A $.10 Dungeons and Dragons Player’s Handbook I bought at a garage sale in fifth grade was probably the single most influential book I ever purchased. A burning desire to read it and play pushed me through some of my dyslexia and I developed coping strategies I use to this day. 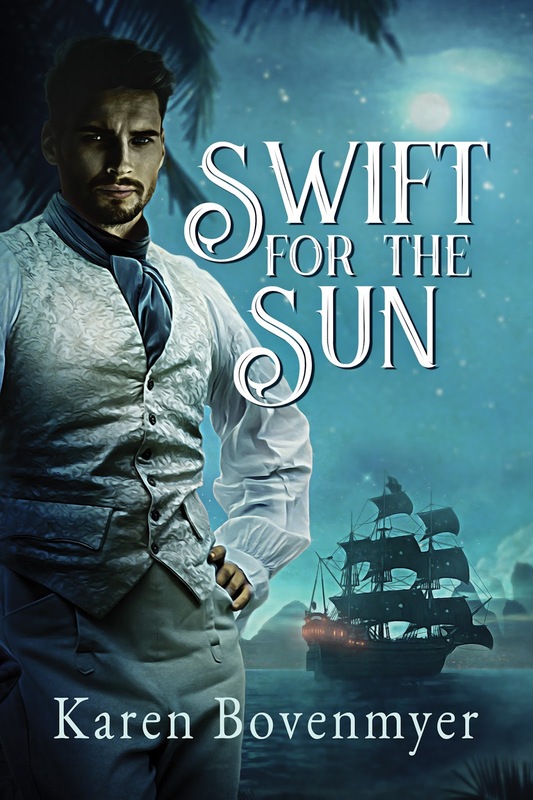 • SWIFT FOR THE SUN was originally a short story. I sent it to Dreamspinner hoping they would buy it for their website, but they wrote me back saying they loved the characters and the setting and asked if I was willing to expand it into a novel. That’s like asking me to pick between children. So unfair. I love rereading J. R. Ward’s Black Dagger Brotherhood, especially Rhage’s book LOVER ETERNAL. A book I tell other people to read all the time is CLOUD ATLAS by David Mitchell. My favourite Harry Potter is THE PRIZONER OF AZKABAN. A Pirates of the Caribbean soundtrack playlist, a lightweight MacBook air, and a 30-minute timer. I have a writing room at home, but I often meet friends at coffee shops. My favourite might be the Periodical Room at Iowa State University Library because it’s a quiet zone—none of my students are allowed to talk to me if they recognize me. TOR, Jabberwocky Agency, epic fantasy with something new to say. 1) Build supports into your life that help you write—for me it’s writing friends. 2) Volunteer slush-read for a magazine, you’ll learn a lot about the stories that are being sent out and how polished yours need to be to have a chance on the market. 3) Join writing groups with other writers who are slightly better than you are. They will inspire you to up your game. Don’t be afraid to leave a writing group if it’s not helping you write, polish, and submit. 3) Create a complete outline for a sequel to SWIFT FOR THE SUN and start work on it if people seem to like the first one. Right now I know New Orleans, a circus, and a Icelandic volcano are involved. When I sat down to write this story, I asked myself “What if Han Solo and Tarzan fell in love?” I wanted a historical tale with lots of adventure, danger, romance, spies, revolutionaries, volcanos, pirate ships and fisticuffs. 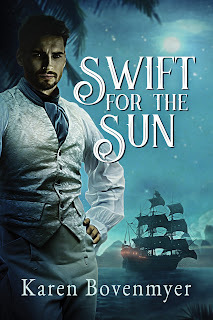 SWIFT FOR THE SUN is a historical romance about a young man in 1820s, who, like me, read too many adventure books. Benjamin has only ever wanted to be a sailor, a man of action. When he finally gets his chance to captain a ship in the Caribbean, it sinks, stranding him on a desert island. There, he’s rescued by an escaped pit-fighting slave named Sun. The two men build a life together, fall in love, and plan for their future—but the pirates, smugglers, and revolutionaries Benjamin was working for come looking for it and him. I had loads of fun writing, researching, and editing this story with Dreamspinner and hope you enjoy it!